Always on the leading-edge of performance refinement, Lingenfelter Performance Engineering (LPE) will once again show its muscle, debuting a 750 hp supercharged 2010 LS7 Camaro SS engine and performance package at the 2009 Specialty Equipment Market Association (SEMA) Show. The vehicle will be displayed at the Hotchkis Sport Suspension booth 24442, Tuesday, Nov. 3 – Friday, Nov. 6, 2009, at the Las Vegas Convention Center, Las Vegas. In addition to ensuring the LS7 Camaro SS delivers more raw power, the 2010 Lingenfelter package ups the ante on overall performance and also features: Lingenfelter 6-bolt LS9 twin disk flywheel and clutch assembly; Lingenfelter Camaro SS twin pump fuel system with Lingenfelter fuel pump controller; Lingenfelter double adjustable Sachs shocks; heavy duty Driveshaft Shop halfshafts; Brembo brake calipers and rotors; Corsa stainless exhaust system; and Hotchkis suspension springs, anti-sway bars and subframe brace. Body enhancements are also part of the Lingenfelter LS7 Camaro SS package. 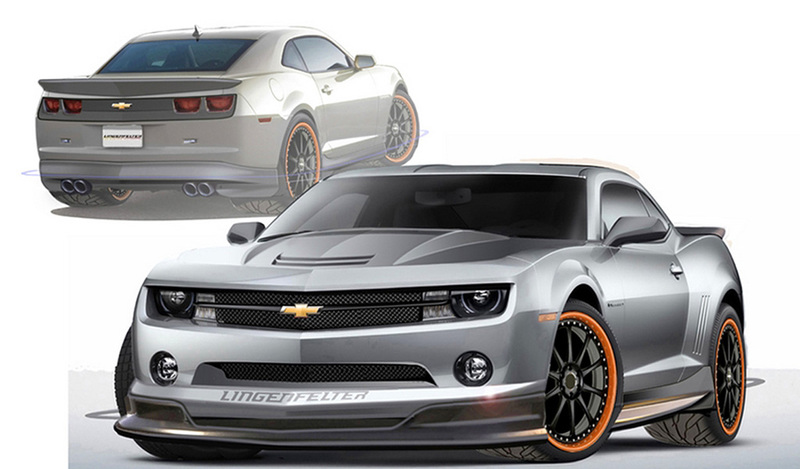 The 2010 SEMA display vehicle features a front fascia splitter, rocker extensions, carbon fiber grille, new hood with air extractors, rear deck lip and spoiler; rear fascia extension; and Lingenfelter Performance Engineering exhaust tips. Custom Lingenfelter 10-spoke design wheels with Pirelli 275/40ZR20 tires on the front and Pirelli 305/35ZR20 on the back are also part of the performance upgrades. A number of driver comfort, performance and style improvements finish off the Lingenfelter package, including: Muth turn signal mirrors; Mito rear view mirror with video display; Lingenfelter/Grant custom steering wheel; and Lingenfelter-brand CNC machined pedal covers, floor mats and embroidered interior. Coveted Lingenfelter badges are emblazoned on the 2010 LS7 Camaro SS exterior, indicating the vehicle’s authenticity as a certified Lingenfelter creation.